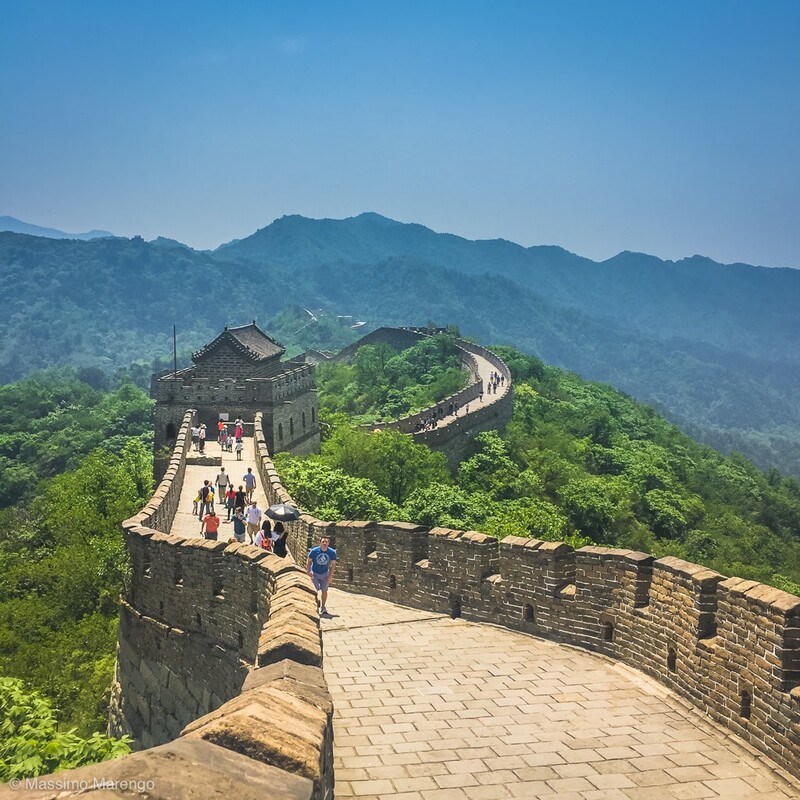 The advantage of the Mutianyau section of the Great Wall, with respect to the more popular Badaling, is that Mutianyau is less frequented, and is possible to find views of the Wall unobstructed by crowds. The restored section of the Mutianyau Wall is 2.5 km long, and includes 23 towers spaced about 100 meters from one of the other. 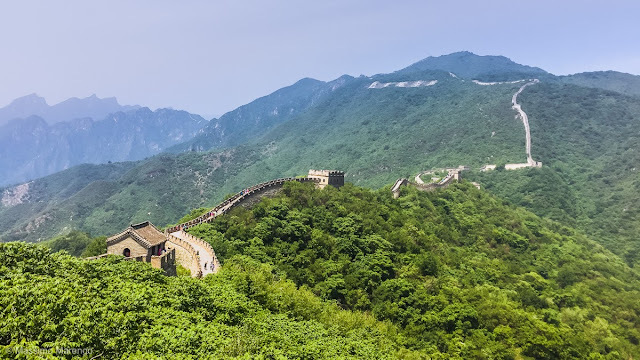 The Wall itself is designed as a raised road, allowing watchmen to easily run from one post to the other in what would otherwise be an impervious mountainous terrain. This allowed to keep under control a vast border with a minimum amount of troops. Some of the watchtowers have a flat top, with a space designed to hold a fire that could be easily lit to alert the main garrison stationed in the valley in case of a mongol incursion. It is said that this fire was made using wolf scats, for their property of producing dark dense smoke easily seen from a large distance. Even as we were visiting, the Wall undergoes continued maintenance. In fact most of the mason work is not original, but reconstructed according to the original design of the wall: only in a few places large panel of glass allowed to see the remnants of the original wall embedded in the modern reconstruction. Towards the end of the restored section of the Wall there is a 200 meters long writing on the mountain: 忠于毛主席, which means "loyalty to Chairman Mao". As I mentioned in a previous post, visiting the Wall is considered a civic duty in China. We spent several hours walking on the broad stone roads built on top of the Wall, without covering the whole length of the restored section. 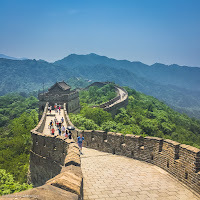 The sight of the Wall, and the views of the landscape around it, are very impressive, and certainly justify the visit, even though a different time in the year, maybe in spring or autumn, is advised to avoid the hot sun that relentlessly accompanied our tour.